The Sunday Salon: It’s a Sunny Day Edition! Southern California has been experiencing the worst case of June Gloom since…I don’t when! Dark skies and cool temps which add up to lots of reading time for me. However, today it’s sunny! The sky is blue so we are heading to Ojai to visit Bart’s Books. Some of you may recall my post about it. It’s the outdoor bookstore with a ton of charm. If you missed that post, click here to read it. It’s really something. I am going back because the last time I went, I forgot my book list. I am also going back because I am doing a Spotlight on Bookstores post for She Is Too Fond of Books. Since yesterday was completely gloomy, I sat on the couch and finished Rude Awakenings of a Jane Austen Addict. It doesn’t come out until later this month so at the request of the author, I am holding off on the review until its release date. I also started My Cousin Rachel, The Link, and The Shadow of the Wind. I swore that I would not read more than one book at a time but all of these are so good that I cannot put any of them down! I just made chocolate chip pancakes so the kids are bouncing off the walls. Time to throw myself into the shower and start my day. I am excited about my trip to Bart’s Books. I wonder what treasures I will come up with this time (must print off TBR list now). 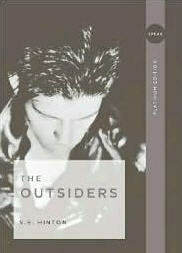 When I visited the Festival of Books a couple of weeks ago, I picked up The Outsiders by S.E. Hinton for my almost-eleven-year-old-son. As some of you may recall, he is not a reader and constantly fights with me over books and reading. To him, reading is boring. He often considers it punishment which is a bit of a stretch but I guess if you really don’t enjoy doing something and your mom makes you do it anyway… I digress. Do you remember reading The Outsiders? We took turns reading it in my junior high English class and then we saw the movie when it came out. I fell in love with Ponyboy who was played by C. Thomas Howell. Actually, I fell in love with a lot of the characters and the movie had a star-studded cast (Patrick Swayze, Matt Dillon, Rob Lowe, Ralph Macchio, Tom Cruise, Emilio Estevez, Leif Garrett, and Diane Lane). As far as adaptations go, I felt this was a pretty good one. Francis Ford Coppola directed and I remember sleeping with the movie posters plastered all over my room. So as I stood in the FOB tent pondering the purchase, I decided to give it a shot. I bought it with the hopes that it would strike a chord with my son. This book was written over 40 years ago. Can you believe that? Anyway, I handed it over to him, he smirked, said “thank you” and tossed it into his backpack. The other night he came up to me, sat on the couch and in his “cool kid” way said that he likes the book…a lot and that he wants to read more books like it. He has been talking about the book to his friends too. I told him about the movie and we both got online to look up all the other books that S.E. Hinton has written and he was thrilled to know that there are several more out there. All this time I have been handing him adventures, fantasies and humorous books that are quick reads but sort of fun and it turns out he likes the deeper stuff. So after all these years, The Outsiders are IN! For more information on S.E. Hinton, check out her website and this post by Jill over at Fizzy Thoughts. Jill attended the S.E. Hinton discussion at the Festival of Books and now in hindsight, I wish I had attended that one myself. If you’ve never read the book, try it out and definitely see the movie afterward. My son and I plan to have a movie night and I will post his thoughts after the viewing. If you happen to know of additional books that are similar in style or theme, I would love to hear about them.